E-2 -- Authorized enlistment in, or advancement to, paygrade E2 having satisfactorily completed one academic year or 1080 classroom hours at an accredited vocational/technical school beyond high school level. E-3 -- Authorized enlistment in, or advancement to, paygrade E3 having satisfactorily completed two academic years or 2160 classroom hours at an accredited vocational/technical school beyond high school level. E-2 -- Authorized enlistment in, or advancement to, paygrade E2 having successfully completed two years at, and subsequently graduated from, an accredited High School Level Military Academy. E-3-- Authorized enlistment in, or advancement to, paygrade E3 having successfully completed three years at, and subsequently graduated from, an accredited High School Level Military Academy. E-2 -- Authorized enlistment in, or advancement to, paygrade E2 having provided conclusive evidence of advancement to paygrade E2 while serving in the Naval Sea Cadet Corps. E-3 -- Authorized enlistment in, or advancement to, paygrade E3 having provided conclusive evidence of advancement to paygrade E3 while serving in the Naval Sea Cadet Corps. E-2 -- Authorized enlistment in, or advancement to, paygrade E2 having provided evidence of successful completion of two years of a Junior ROTC Program. E-3 -- Authorized enlistment in, or advancement to, paygrade E3 having provided evidence of successful completion of three years of a Junior ROTC Program. 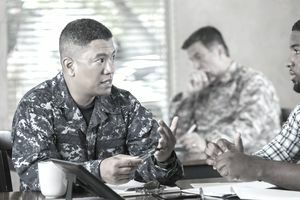 E-2 -- Authorized enlistment in, or advancement to, paygrade E2 having referred one Nuclear Field individuals or two non-nuclear Field individuals for Naval Service to a Recruiter. These referred individuals have enlisted in a USN or USNR program including DEP and will access within 12 months. E-3 -- Authorized enlistment in, or advancement to, paygrade E3 having referred two Nuclear Field individuals or four non-nuclear Field individuals for Naval Service to a Recruiter. These referred individuals have enlisted in a USN or USNR program including DEP and will access within 12 months. E-3 -- Authorized enlistment in, or advancement to paygrade E3 having provided evidence of successful completion of requirements for Eagle Scout or the Girl Scout Gold Award. E-2 -- Authorized enlistment in, or advancement to, paygrade E2 having provided evidence of receiving the Civil Air Patrol Billy Mitchell Award. After minimum time-in-grade (9 months as an E-2), they are promoted to the grade of E-3. After completion of A-School, they may be promoted to the grade of E-4. These programs do not preclude enlistment at pay grade E-2 or E-3 under the above programs. *AIPE is the Accredited Institutions of Postsecondary Education (AIPE) book published by the American Council on Education (ACE). NACES is the National Association of Credential Evaluation Services. Colleges and universities not listed (or are listed as “candidate” institutions) in the AIPE directory are not authorized for award of a higher education code or enlistment grade.